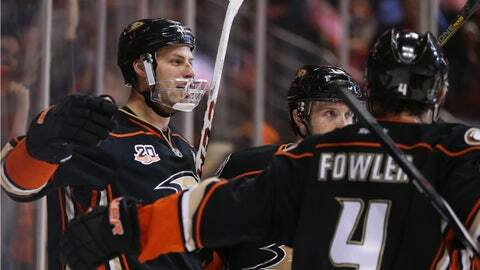 ANAHEIM, Calif. — The Ducks served as punching bags earlier this week in Dallas, but Friday night back on their own turf, they punched right back for a 6-2 win at the Honda Center, taking back a 3-2 lead in the Western Conference playoff series. It was finally an emphatic win that showed why the Ducks are the No. 1 seed in the West. "We responded and came when they made a push," said center Andrew Cogliano. "We got goals, and that’s what you have to do in the playoffs. When the momentum starts going the other way, you have to take it back and keep pushing in the other direction." More importantly, the Ducks got their captain, center Ryan Getzlaf, back as well. Despite a shaky, turnover-prone start, Getzlaf ended with a three-point night to tie his postseason career high in points and assists to bring his total to seven points in the 2014 playoffs. Getzlaf also surpassed Teemu Selanne as the club’s all-time postseason points leader as he now has 66. Selanne is only two back with 64. "Well judging by my turnover to (Jamie) Benn that he put in the back of the net, I would say that’s not (the start) that I was looking for," Getzlaf said. "As for my game, I felt like it got better as the game went on. I felt more and more comfortable." His presence was felt immediately. "Everytime you get your captain back, the guy who’s been your team leader, it’s going to make you feel better," said head coach Bruce Boudreau. "It’s like your big brother is back. He was there and guys felt a little more secure and he came out and he played a great game, as well as the other guys." A big hit on Corey Perry in the first period by the series’ biggest troublemaker, Ryan Garbutt, was a big momentum changer. With a 1-0 Anaheim lead, Garbutt speared Perry as he was coming off the boards on a line change, and Perry was down on the ice in pain for several moments as Garbutt was led off the ice smirking to serve a five-minute game misconduct penalty. Benn then scored a shorthanded goal to tie the game, but Rickard Rakell scored only 26 seconds later to take back a Ducks’ lead. It was his first career NHL goal. Boudreau felt Garbutt’s hit was intentional and Dallas head coach Lindy Ruff didn’t necessarily disagree. Garbutt didn’t stop there, and neither did Antoine Roussel, who went so far as to snap his stick in the box while jawing with fans. Physicality and goonery is an identity in Dallas but in this instance, it cost the Stars more than it aided them. The Ducks made them pay, scoring four power play goals for a new postseason club record. "It tells me that I haven’t done a good enough job with Ryan Garbutt yet," Ruff said. "There’s some nights we act like a young team. We were a young team tonight." Goaltender Frederik Andersen bounced back from his poor performance in Wednesday’s Game 4, getting the win and 34 saves. "He made the saves in there that he had to make at the right time," Boudreau said. "When they were pushing and it was 2-1, or when they were pushing and it was 3-2, Freddie would stand tall and that’s what good goalies do." It was a win to set the tone for the next game — back in a hostile Dallas arena where the Ducks struggled all season. Much like they did Friday, the Ducks need to be the ones to dictate the way the game will be played. "It’s about maintaing our focus," Getzlaf said. "When we got to Dallas last time, we got a little revved up and got into some things that weren’t part of our game. Tonight, we did a better job of focusing on what we need to do and we need to do that the next game."